Real yields have fallen dramatically since the Treasury's last rate reset on November 1. The current fixed rate of 0.5% is therefore "above market." Today's real yields justify a fixed rate of about 0.2% to 0.3%. I Bond investors should always seek out the highest fixed rate, and that means buying the full 2019 allocation before May 1. To be clear: I think the fixed rate for U.S. Series I Savings Bonds will fall on May 1 from its current level of 0.5%, the highest in more than 10 years. But I don't know it. Why? Because the U.S. Treasury gives no hint about how it determines the fixed rate for I Bonds. It simply announces the new rate every May 1 and November 1. It's a mystery. But I've been tracking these decisions for a long time, and I believe the 0.5% fixed rate has little chance of continuing. It does appear the Treasury's rate-reset decision takes into account the current real yields (meaning yields above inflation) on 5- and 10-year Treasury Inflation-Protected Securities. It's important to note that the I Bond's fixed rate stays with the bond until it is redeemed or matures in 30 years, and it is technically the "real yield" of an I Bond ... the yield above inflation. I Bonds carry a composite interest rate (currently 2.83%) based on a combination of the permanent fixed rate (currently 0.5%) and the inflation rate (also called the variable rate, currently 2.32%). The variable rate changes with inflation every May 1 and November 1, and those are also the dates the Treasury resets the fixed rate. While the fixed rate formula is a mystery, you can be sure of one thing: When real yields for 5- and 10-year TIPS rise, a higher fixed rate is likely. When they fall, a lower fixed rate is likely. In the face of that dramatic decline in real yields, the Treasury is almost certain to lower the I Bond's fixed rate on May 1. But how low will it go? To get an idea, I analyzed real-yield data for all I Bond resets over the last 10 years. Understand that the I Bond's fixed rate generally has a yield spread of 50 basis points or more measured against a 10-year TIPS. The yield spread is justified because I Bonds have a lot of advantages over TIPS: a flexible maturity, better compounding of interest, tax-deferred earnings, and much better protection against deflation. At the last rate reset, on November 1, the spread against a 10-year TIPS was 60 basis points, fairly normal. Now that spread has dwindled to 4 basis points and has actually gone negative versus a 5-year TIPS. This is strong evidence the 0.50% fixed rate will drop on May 1. But how low will it go? Look at the times the fixed rate reset to 0.3%. In both cases, the TIPS real yields were higher than they are today. I think you can throw out the November 2009 reset; that's ancient history and the bond market has since been through years of lower yields. 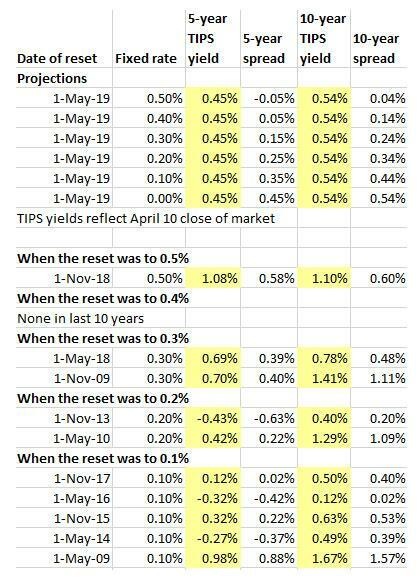 But the May 2018 reset to 0.3% - when the 10-year TIPS was 24 basis points higher than today - indicates less-than-solid justification for a reset to 0.3% in May 2019. What about 0.2%? Now this gets interesting. Throw out the May 2010 reset, which again reflects "ancient history." The reset in November 2013 to 0.20% was a strange one for the Treasury. The 5-year TIPS yield at the time was -0.43%, setting up a whopping 63 basis point advantage for the I Bond. This one qualified as a "gift" from the Treasury, and made I Bonds a no-brainer purchase from November 2013 to April 2014. But note that the 10-year TIPS was yielding 0.40% just before the November 2014 reset, not too far off from today's 0.54%. For this reason, I think 0.20% is probably the floor for the May 1 reset, and 0.30% is the ceiling. Data from the last 10 years support a rate of 0.10%, but I think the Treasury would be wary about going that low in a volatile interest rate environment. Conclusion: I think the rate reset is headed toward 0.20% or 0.30%. If real yields continuing declining over the next 19 days, 0.20% is more likely. If they rise somewhat, 0.30% is more likely. How should you act on this information? I Bond investors should always seek a higher fixed rate, which stays with the I Bond for all of its 30-year term, or redemption. And, because the fixed rate is likely to fall on May 1, I recommend buying your full allocation before May 1, up to the limit of $10,000 per person per year. We already know what the new inflation-adjusted variable rate will be for all I Bonds. The March inflation report, issued Wednesday, set that variable rate at 1.40%, annualized. All holders of I Bonds will receive that variable rate for six months, with the starting date depending on the initial month of purchase. You will lock in the 0.50% fixed rate, along with the variable rate of 2.32%, for a composite rate of 2.83% for a full six months. Then you will transition to the new variable rate of 1.40%, plus the fixed rate of 0.50%, for a composite rate of 1.90% for six months. Over a full year, you will earn a combined rate of about 2.4%. OK, 2.4% isn't a thrilling return, but locking in the I Bond's highest fixed rate in 10 years is a smart move. It is 50 basis points higher than inflation, and that means that even after paying federal taxes on your eventual earnings, you will probably at least match inflation. Will we see a higher fixed rate in the future? Maybe. Or maybe not. Because the I Bond's fixed rate was set on November 1 and cannot change until May 1, it is locked into a higher rate environment than currently exists. Buy before May 1 and take advantage of that above-market rate.